Every aspect of VF Engineering Engine Mounts have been fully engineered for high quality fitment and highly demanding performance and expectation. VF Engineering’s in-house horizontal, turning and milling CNC’s and plastic molding plant has been fully exploited to create a product with internationally un-rivaled material technology, quality, and performance. 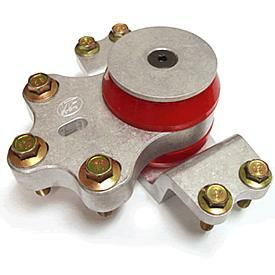 Stock Engine Mounts were designed as a soft mount flexible mount to provide a very comfortable drive. Its drawback was the large amount of engine movement allowed under torque load and on hard acceleration. This engine “slop” greatly decreases stability and smoothness under high performance driving conditions and rapid gear selection. VF Engineering Engine Mounts are designed, tooled up, and manufactured as a complete new replacement containing a molded, high durometer polyurethane insert. VF Engineering Engine Mounts are constructed from billet aluminum and supplied with the highest tensile hardware available.